Michael McIntyre is an English comedian, actor and TV presenter. Performing stand-up since 1999, he really started to become a household name in the late '00s following a series of successful appearances on BBC One's Live at The Apollo. In 2010 he hosted the Royal Variety Performance, becoming the show's youngest ever host. 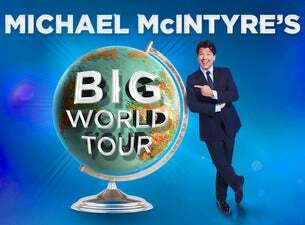 In addition to stand-up, McIntyre has hosted his own BBC One comedy programme, Michael McIntyre's Comedy Roadshow, has featured in three episodes of Live at the Apollo and, in 2011, was a judge on Britain's Got Talent. He currently also presents his own Saturday night series, Michael McIntyre's Big Show on BBC One. In 2018, he became the highest-selling artist in the history of the O2 Arena, selling over 400,000 tickets over 28 shows and surpassing the record previously held by by pop act Take That.